Engine braking is the phenomena experienced whenever a rider rolls off the throttle and the motorcycle slows down due to the resistance provided by the engine and transmission. The affect is enhanced by changing to a lower gear. Prior to the downshift the wheels, engine, and transmission have a matched speed. The downshift changes this and causes the engine to rev up a bit as the clutch is released causing more slowing affect similar to braking to the rear wheel. Engine braking can be used either alone or in combination with using the brakes, depending on the desired braking needed. If you’re slowing using only engine braking, it is advisable to flash the brake light to alert traffic behind. While engine braking is useful to slow down from higher speeds, there is an added benefit when using this technique when riding at low speeds. It is helpful when slowly approaching a red traffic light and having the ability to accelerate away if the light turns green before coming to a stop. Another benefit is the continued development of the habit of being first gear whenever coming to a complete stop. The downshift to first sets up the rider up to be in the proper gear to start out or to accelerate quickly to avoid a collision from the rear if the vehicle behind doesn’t stop. 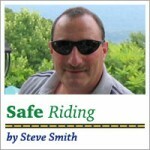 New York native and Waterbury, CT-area resident Steve Smith is a nationally-certified Motorcycle Safety Foundation Ridercoach and instructor with the Connecticut Rider Education Program. He began riding off-road as a youth and on-road at age 20 with a Honda CB400T. He currently rides a 2011 Kawasaki Concours 14. Smith is a graduate of Fairfield University with a degree in Electrical Engineering and a Masters in Management of Technology. Glad to do so. I wants this website to be “interactive” – but in a respectful manner. Thank you for posting my comment. It really made my day. As a young rider watching my dad ride (’32 Indian Scout),I was always aware of downshifting. My father did it because the brakes on that monster (as he called it) were some what problematic for braking efficiency. My first bike was a 305 Honda Dream and downshifting became a habit. The power band was always in the 8-11,00 rpm range and, as a young and dumb rider, I tried to keep it there whenever possible. From there i went to a BSA Lightening that my older brother gave me to use for a summer. With that kind of power I always liked going away from lights “first.” To do that you had to be in first gear before you came to a stop. Also I liked the sounds it made as it backfired thru the pipes going down from fourth gear. On my next bike, (750 Norton Commando, the practice continued as I toured the United States from Pennsylvania to California thru the South and west. After joining the service (USN), I rode a 500 Suzuki Twin all over Northern California. The power band on that bike was always in the mid range with the lower rpm being somewhat slow. Guess how I rode it? I bought a Harley Sportster in the Navy and after my discharge toured the country from Washington state to Pennsylvania and back. To me that is life in fourth gear. My current ride is a 1978 T140v Triumph Twin which, after 20 years of sitting in the garage (down shifted to neutral), is finally on the road again – getting up and down shifted whenever the temps rise over 40 degrees. The lessons I learned from downshifting on a bike also transferred to life. There has always been an opportunity to grab life by the throttle; shift down to a lower gear; get your rpm up to swing around the next corner – just to see what is there and how to experience the ride.